b.t.w. - this is a figment of my imagination. A retro done in a pink pearl with a white pearl top. Ford never intended to do the car in this color but this page is still dedicated to PINK! PINK! 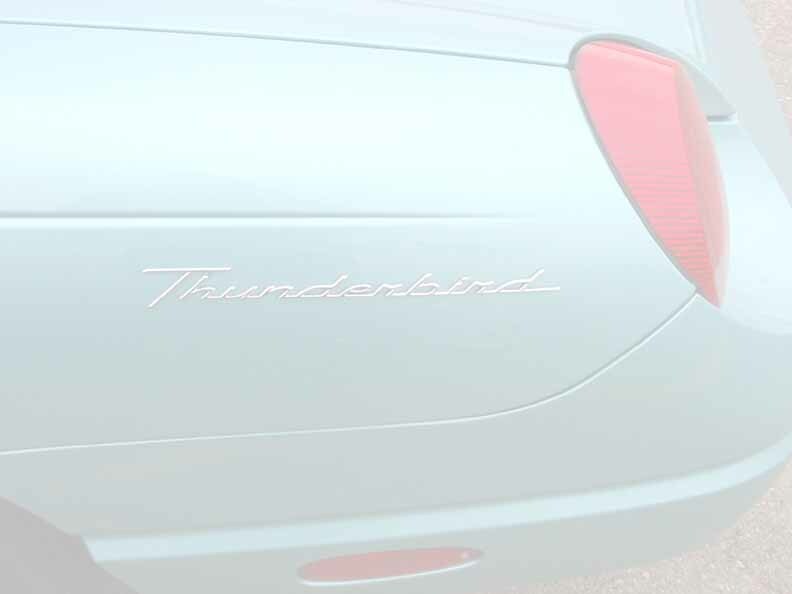 Though Ford never intended to have this color on the retro, it does exist on several 02 and 03 models customized by Galpin Ford of California as one of their Galpinized (offsite link) Thunderbirds. Galpin used a 1957 color called Dusk Rose, a color used on the 1957 Ford Thunderbird. You might call the Galpinized Tbirds "Code 2 or code 3" in diecast lingo. There have also been some owners that have custom painted their Thunderbird "pink". Later, in 2004, the movie Thunderbirds, came out based on a series featuring puppets popular in England and Japan. Ford supplied the cars used in or to promote the movie including a bright pink Thunderbird and the Bright PINK FAB 1 vehicle, the leading lady's choice of automobile. There are also a couple of Pink Thunderbird songs you may find on the net. One is from 1957 and there is the current one below by the Lazy Poker, a group in England. sung by Lazy Poker on youtube - an English group.